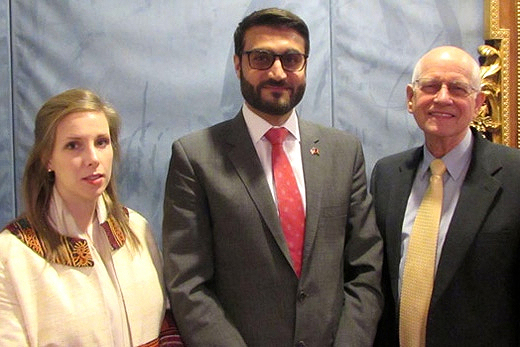 Hamdullah Mohib (center), Afghanistan's ambassador to the United States, and his wife, Lael Mohib, pose with professor Marion Creekmore during a visit to his South Asian politics class. Hamdullah Mohib, ambassador of the Islamic Republic of Afghanistan, and his wife, Lael Mohib, visited Emory earlier this month to discuss the country's politics with students and faculty. The couple represents a new generation of Afghan leaders. As a child, Hamdullah Mohib lived in refugee camps; as a teen, he left Afghanistan to escape the Taliban. Now at age 32, he has a PhD from Brunel University in the United Kingdom and worked for the American University of Afghanistan and Intel Corporation before joining the government. Lael Mohib, founder of the Enabled Children Initiative, also worked for the American University of Afghanistan. “Afghanistan, as well as India and Pakistan, are playing increasingly important roles in regional and global affairs,” notes Marion Creekmore, distinguished visiting professor of history and political science at Emory, whose course "South Asian Politics Since 1945" was visited by the Mohibs. Creekmore, former U.S. ambassador to Sri Lanka and the Maldives, draws heavily on his personal experience and connections in his teaching, offering students a combination of academic and practical expertise. “Students interested in global work need to develop a solid understanding of these countries’ current political, economic and security concerns as well as how their policy decisions of the past are influencing their present thinking and action," he says. During their visit, the Mohibs translated students’ studies into the real-world framework of a country focused on managing a successful transition to self-reliance in the wake of the drawdown of U.S. and NATO troops. They stressed that the new Afghan government is rebuilding its citizens' trust by tackling internal corruption and taking actions to create a unified and peaceful political future. The majority of Afghanistan’s citizens are under 35 — a generation that grew up with war and is deeply invested in peace. After 40 years of continuing war, “being an ordinary country is what has escaped us," the ambassador explained. Students in the South Asian politics class focus on the relationships between Afghanistan, Pakistan and India. For their final project they are working in small groups, simulating the role of policy advisers to the leader of one of the countries, and recommending the policy objectives and supporting initiatives that should be pursued toward another of the countries over the next five years. Students asked detailed questions covering security concerns, the repatriation of Afghan refugees in Pakistan, bilateral relations with Pakistan and India, bilateral and multilateral trade and investment, women’s rights, multiculturalism and other topics. The Mohibs engaged candidly with the students, briefing them on the larger issues and context even as they answered their specific questions. The ambassador also wanted to better understand how the students perceive Afghanistan and expressed the desire for a mutual learning process. Throughout the day, Lael Mohib, who most recently served as chief of staff at the American University in Kabul, emphasized the centrality of the women’s empowerment agenda to the country’s goals for self-reliance. During their April 6 visit to campus, the Mohibs also met with Gary Hauk, Emory's vice president and deputy to the president; spoke to political science professor Carrie Wickham’s class on Islam and politics; consulted with Karin Ryan of The Carter Center; and engaged with a Halle Institute-sponsored luncheon for faculty.